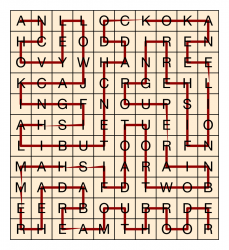 In a Pathfinder puzzle a list of words must be found in the grid, following a single path such that each square is visited exactly once. This means that the path can't cross itself, which helps the solver eliminate options as they progress. 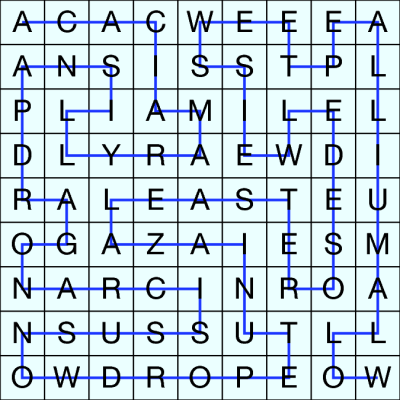 In easier puzzles the word list can be given, as in word search puzzles, but often just the theme and a starting letter are given. 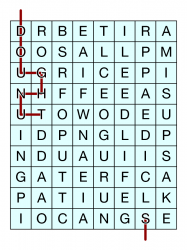 In the sample below the word 'DOUGHNUT' is highlighted - the reader must then find a further set of puddings!